Cathy had wanted an electric car since the 1990's, but there were none available. She bought a 2001 Honda Insight. It didn't have a plug, but it was a cool car. After seeing Who Killed the Electric Car in 2006 and finding out that all of the automakers proved that awesome electric cars could be made and people loved them until they were taken back and crushed, we had to get involved. So, we put down a deposit with Tesla Motors on November 30, 2006. We received our Tesla Roadster on June 5, 2009 and that ended our interest in driving gas cars. In the meantime, we bought a 2002 RAV4 EV, but that's another story. As early adopters, we got to be part of the early explorations of what it's like to drive electric. Here are some of the projects we've taken on to study, enhance and maintain our Roadster. In the early days, before the Roadster entered production, there was a strong community of Roadster reservation holders. Many of us participated in the Tesla Owners forum. To get an idea of where we all came from, we came up with the idea of building a map showing where we all lived. We built the map and the folks at Tesla liked it, so they gave us the ZIP Codes of all the reservation holders to add to the map. That gave us all an idea of how we were scattered around the country and the world, without revealing anything too personal. That was cool for a few days, then one owner freaked out because Google placed the pin for his ZIP Code pretty much directly on his house. We removed that pin from the map, but Tesla decided maybe making everyone's ZIP Code public wasn't such a good idea. The map went back to being totally opt-in and lasted until after production of the Roadster ended and Model S reservation holders became a much larger community, not as closely knit, and less interested in our old map. Our Tesla Owner Map is preserved here for historical interest. The original Roadster came with an option for a premium sound system that included a JVC head unit. The head unit had all sorts of cutting edge features for the time, including the ability to play music from an iPod or iPhone. Sadly, the user interface was horrible. It had to be replaced. We found an Alpine unit we liked and installed it ourselves. It sounded straight forward at first, but it's that last 10% that takes 90% of the work. In this case, it was running the USB cable through the dash, down the side and under the foot well carpet into the cubby where there was storage from the iDevice. That required stripping the interior to bare metal, including removing the driver's seat and the center console. The Head Unit Replacement Slide Show details how we did it in our v1.5 Roadster. Replacing the head unit in the various v2.x Roadsters may be different. The Tesla Roadster maintains an internal log that stores information about the car's full history and more detailed records of recent use. This log can be downloaded to a USB thumb drive. Various Tesla owners have figured out a lot of what the log file contains and written programs to extract that information, most notably Scott451 from the Tesla Motors Club forum. Using a log parsing program, owners can extract interesting data from their cars. Using data from the log file, it's possible to analyze lots of interesting data, whether it's energy use while crossing a mountain pass or examining performace on a 1/4-mile drag race run, as in the chart below. Tom wrote a log parser, VMSParser, to complement Scott's work, and got some excellent feedback and help from Scott along the way. As part of his work to decode the Roadster's log file, Scott learned a bunch about the data that's available on the Roadster's internal CAN bus, an extension of the on board diagnostics bus (OBD) that's standard on modern vehicles. The protocol used on the Roadster's service CAN bus goes far beyond what the standard calls for, and Scott figured out a bunch of cool stuff he could read. With that data available, he came up with the idea of hooking it up to a small Linux computer with a cellular connection to create an aftermarket telematics system for the Roadster that would work on any phone that supports SMS text messaging. With that, owners gained the ability to monitor the car charging remotely, eliminating the need to babysit the car while charging at a dodgy RV park out in the boonies, waiting to see if the breaker pops. We could read out the state of charge, battery temps, all kinds of fun stuff, and track the vehicle, whether to time dinner while your spouse battles traffic or to direct the police to the whereabouts of a bold but unlucky car thief. There were easy ways to install the Tattler that left it visible, and thus defeatable in a theft situation, but we wanted a more hidden and secure install. We leveraged what we learned from the head unit replacement to mount the Tattler hidden in the side console with the cellular antenna in the dash where it got great reception despite being totally hidden. This Tattler Install Slide Show shows the install process we used for our v1.5 Roadster. The process for the various v2.x Roadsters may be different. The same process applies to installing OVMS. You may not want to bury the OVMS box in the side panel because that makes firmware updates more work, but putting the OVMS antenna under the speedometer enclosure is still a win. The Tattler was awesome, but also expensive and closed. Scott's work inspired Mark Webb-Johnson, a Roadster owner in Hong Kong, to create a less expensive, open source telematics unit for the Roadster with support for smartphone apps as well as text messaging. Although Mark did most of the work on both hardware and software, this project inspired the programmers in EV community to add to Mark's Roadster work and expand support for other vehicles. Thus was born an active, open source, community for developing telematics solutions for their own electric vehicles. In the interest of helping owners not interested in diving into microprocessor programming tools, Tom created a page with instructions for how to Update the OVMS Firmware without going through all the setup required to work on the software. Instructions for using a super cheap cellular plan from H2O Wireless, a big improvement in pricing compared to AT&T. Instructions for using a Hologram, important for anyone using AT&T, or other providers that depend on AT&T such as H2O Wireless, as they will all stop working on December 31, 2016. Tom used OVMS data to model Roadster charging times by temperature, charge mode, and input power level. 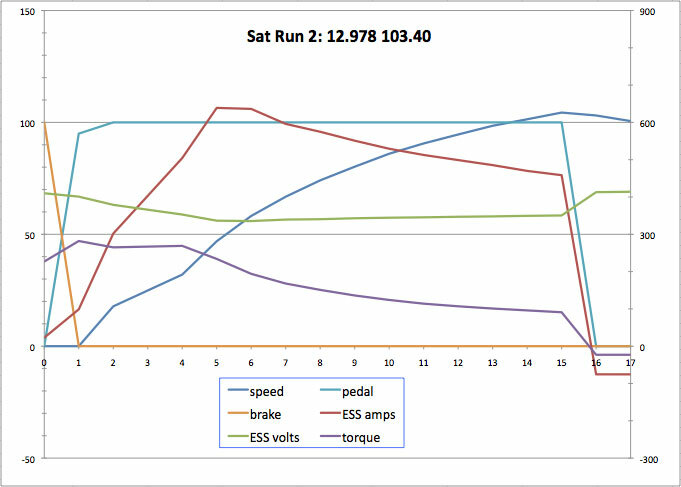 Tom explained the method he used in his Roadster Charge Time Predictor blog entry. That became the basis for being able to do "end time" charging via OVMS and Tesla Tattler. There's also a web version of the calculator. The Roadster uses a unique charging port connector that Tesla invented because there as no standard and what had been used for the first generation of production electric vehicles (like our RAV4 EV) was not the future. There was a standards body working on it, but it was moving too slowly. The Roadster's connector supports a high charge rate, but is heavy and expensive, totally appropriate for a car produced in the hundreds, but not for cars produced in the millions. There was eventually a standard developed and adopted by the industry (J1772), but well after the Roadster entered production. The standard is electrically compatible with the Roadster, meaning it uses the same signaling to establish communication between the car and charging station, but the connector is physically incompatible with the Roadster's. When the standard first came out, it wasn't well known that it was even electrically compatible with the Roadster. We did some research, tested the Roadster with Cathy's oscilloscope, built an adapter, and proved it worked. I believe we were the first Roadster owners to charge at a standard public charging station on September 14th, 2010, using a ClipperCreek station at a water treatment facility in Olympia, WA, that makes its own electricity. There was a time before the Model S was formally introduced when we thought it would use a standard electric vehicle charging connector. We in the Roadster community thought that with a much larger community of Model S owners, that would lead to widespread charging infrastructure we could all use. Sadly, things didn't turn out that way. The federal government spent big bucks installing charging infrastructure and maddeningly limited to 7.7 kW (25 miles of range per hour of charging), even though the standard is capable of 19.2 kW (about 70 miles of range per hour of charging). The Roadster is capable of charging at 16.8 kW (60 miles of range per hour). The slowest tolerable rate of charging is always the fastest charging rate supported by the EV driver's own car. Obviously, the coming wave of Model S owners would demand charging infrastructure supporting their vehicles, capable of 19.2 kW charging, and Roadster owners would be able to use it as well, if only our cars had a standard connector, hokey adapters aside. The two of us embarked on a project to convert our Roadster's charge port to use the standard J1772 inlet. We were 99% successful. We tracked down the necessary parts, designed the cable and created a mounting solution. Cathy created a super cool J1772 proximity signal controller board to handle the one part of the J1772 standard that the Roadster didn't do natively, a safety feature that was done differently and required adding some new electronic communication. Her board was small, inexpensive, and required no external power from the car. We built and tested a crude prototype including the awesome circuit board and found a vendor that could produce a final version. It was so awesome. Then two things happened that killed the project. First, Tesla announced the Model S and the new non-standard charging connector they had designed for it. While the J1772 standard could do 19.2 kW charging just fine, there was no standard for faster charging (DC quick charging) that uses commercial-level power to charging at a much higher rate. What was being worked on in the standards group was awkward to use, and therefore unfriendly to consumers, and once again moving too slowly to be useful. Tesla's connector supports both 19.2 kW charging from residential power and 135 kW charging from Supercharger stations. Tesla did the right thing even if they did mess up our plans. Second, another Roadster owner, Henry Sharp, came up with a J1772 adapter (the CAN) that's much better than the hack we developed and also better than the solution that Tesla came up with. Henry later developed another CAN that lets Roadster owners charge at 19.2 kW Model S charging stations, which are showing up at hotels and other locations to complement the Supercharger network. We now own both of Henry's adapters. Hurray for Roadster owner innovation. As an amusing footnote, we happened to find a product page on a Tesla accessory company offering a J1772 Roadster conversion, using our photo of our prototype testing charging as their product photo. I sent them an email explaining that our product didn't exist and asking them to stop using our photo to promote their alleged product. They did take down the photo and said they'd be in touch about perhaps using our technology, but didn't follow through. I'm guessing they figured out there's no market for their presumably non-existent product. The Roadster's trunk light is extremetly ineffective. It's a tiny, dim, incandescent bulb that puts out very little light. Even worse, it's mounted a couple of inches down on the back wall of the trunk. At best, it poorly lights a some of the trunk space. If the trunk is full, and it always is full on a trip, it's hidden under the contents and is completely useless. On the Tesla Motors Club forum, Scott451 of Tesla Tattler fame suggested replacing that stupid little bulb mounted inside the trunk with a strip of LEDs mounted to the trunk lid. After doing that, our trunk lights up like a tanning bed. You could sit in the trunk and read a book while wearing sunglasses. See the TMC post on how we mounted the light strip along with ideas from others and an Instructable from W.Petefish. The Roadster has a pump that circulates fluid through the battery pack when then car is on or charging. It's not a great pump and wears out. The pump itself is inexpensive and easy to obtain and not too difficult to replace. While it's generally best to let Tesla replace it when it fails, we learned how to do it ourselves. In May, 2011, we donated a Roadster charging station to the city of Ellensburg, WA. The city paid the tiny cost of electricity for it until January of 2014. At that point, we reached out to the local Tesla community, asked for contributions, collected enough money to keep it running for another few years, and handle paying the bill from the collected funds. For a few months, it was interesting to the local Model S owners. They arranged to keep a shared adapter locked to the station. Then Tesla put in a Supercharger station and that interest ended, and the shared adapter got moved elsewhere.